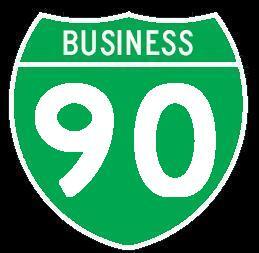 In South Dakota, there are several business loops of Interstate 90. The 2004 South Dakota Offical Highway Map only shows a business loop at Mitchell. AARoads.com, reports business loops at Spearfish, from M.P. 10 to M.P. 14. Sturgis, from M.P. 30 to M.P. 32. At Rapid City, it runs along SD St Rt 79 and Truck BY-PASS U.S. Rt. 16 from M.P. 51 to M.P. 60. There is a report of a loop at Wall. A short loop is reported at Murdo from M.P. 191 to M.P. 192. Again one is reported at Vivian, from M.P. 212 to M.P. 214. At Chamberlain, a loop is said to cross the Missouri River. Another short loop runs along SD St Rt 45 at Kimball. One more loop is reported at Plankton, between M.P. 310 and M.P. 312. The loop at Mitchell is the only one on the state map. The Unoffical South Dakota Highway Page, also reports business loop at each of the above sites, with the exception of the loop at Spearfish. 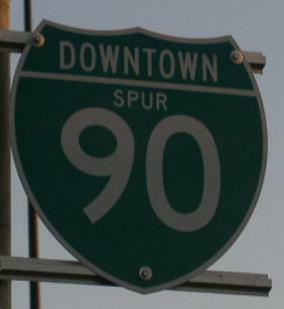 Like Interstate 29, at Sioux Falls, I-90 has a downtown spur. This spur is not labeled to well south of Benson Road. It runs along South Dakota State Route 115, on Cliff Avenue, Benson Road, and Minnesota Avenue. Below the loops and spurs that RMS&W have confirmed.